This is a simple Add-On for XP and VX that allows you to change the Window tones on game (in Ace that function already exists) You can change 'back' tone, 'cursor' tone and 'border' tone separately. I used the Window class from Pokemon Essentials as a base to make this. 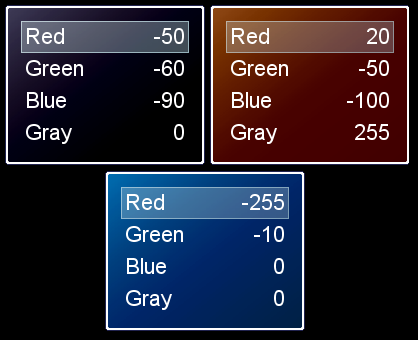 Red, Green, Blue and Gray are managed separately. Different window sprites ('back', 'cursor' and 'border') are managed separately. get, set and increase(positive or negative) color values. Where are you from? Do you spell gray or grey? It doesn't matter, it supports both. return if !srcbitmap || srcbitmap.disposed? if changeBitmap && @_windowskin && !@_windowskin.disposed? The next codes can be used also changing 'back' to 'cursor' or 'border' depending on the situation. I used the 'back' case because it's maybe the most common. @window.set_back_gray(value)Or you can change it increasing the value to the actual tone. # This scripts changes "Status" to a tone management window. If you have any problem with that script or with incompatibilities don’t hestitate to ask.